New Publication in Advanced Electronic Materials! The realization of organic thin film transistors (OTFTs) with performances that support low-cost and large-area fabrication remains an important and challenging topic of investigation. The unique electrical properties of singlewalled carbon nanotubes (SWNTs) make them promising building blocks for next generation electronic devices. Significant advances in the enrichment of semiconducting SWNTs, particularly via π-conjugated polymers for purification and dispersal, have allowed the preparation of high-performance OTFTs on a small scale. The intimate interaction of the conjugated polymer with both SWNTs and the dielectric necessitates the investigation of avariety of conjugated polymer derivatives for device optimization. Here, the preparation of polymer–SWNT composites containing carbazole moieties, a monomer unit that has remained relatively overlooked for the dispersal of large-diameter semiconducting SWNTs, is reported. This polymer selectively discriminates semiconducting SWNTs using a facile procedure. OTFTs prepared from these supramolecular complexes are ambipolar, and possess superior mobilities and on/off ratios compared to homo poly(fluorene) dispersions, with hole mobilities from random-network devices reaching 21 cm2 V−1 s−1. 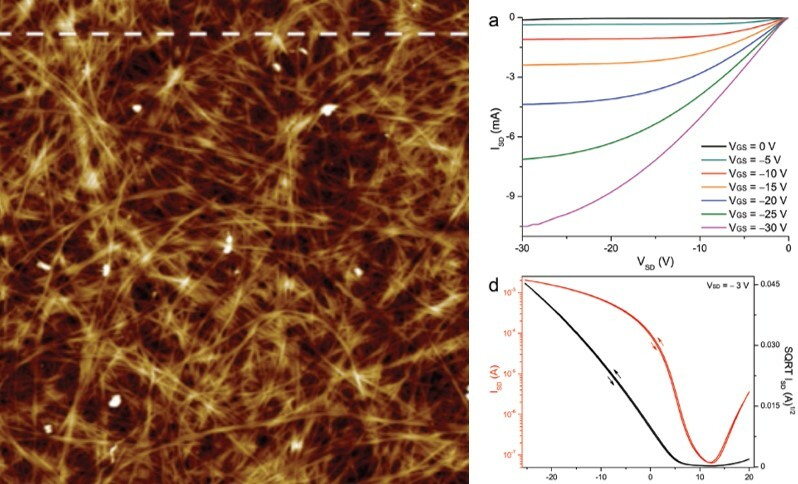 Atomic force microscopy measurements suggest the poly(carbazole)–SWNT composites form more uniform thin films compared to the poly(fluorene) dispersion. Additionally, treating the silicon dioxide dielectric with octyltrichlorosilane is a simple and effective way to reduce operational hysteresis in SWNT OTFTs. New Publication on DNA sensors! Stability of PBDB-T OTFTs! New Publication in J Mater Chem C!